Comments: Comments Off on J.R. Smith is the key to a Cavs win. J.R. Smith is the key to a Cavs win. NOTE: Friday on NNR Samantha Bunten of NBC Sports and I discussed Game 4 of the NBA Finals. On Friday I suggested that J.R. Smith couldn’t hit pavement if he fell off a building. That is true. However, if the Cavs are going to win game 5, Smith has to find his range. He has playoff experience and averaged 12.7 points and 42.5 shot percentage in the regular season. Head coach David Blatt has to give the Cavs starters some rest. However, he has to have better timing. His decision to take LeBron James out at the start of the 4th quarter was a huge mistake. The Cavs had just taken back the momentum and had closed the score from more than a dozen to 3 points. Without LeBron in the lineup, the Warriors quickly rebuilt the lead to 12 before LeBron was back in the game. Blatt also needs to try James Jones and Shawn Marion. Jones can score and Marion plays pretty good defense. They need to contribute if the Cavs expect to have enough energy to win games 5 and 6. The series is tied 2-2 but the Cavs loss in Game 4 is a huge factor. To have any chance to win, the Cavs must win game 5. The extra rest between games has to help them get back to the great defense they played in the first 3 games. If they do win today, they have a great shot to take the title. If not, it is going to be a long hard road up hill all the way. Comments: Comments Off on Has anyone seen this man? NOTE: On NNR Samantha Bunten of NBC Sports and I analyzed the depth chart of the Browns. There will be no shows until Thursday the 28th. Paul Banks of the Washington Times will be my guest to talk Browns and Cavs. On the 29th Samantha and I will talk about which teams have done the best and the worst with both Free Agency and the draft. I fully expect to see the picture of Kevin Love on milk cartons soon. He has not been on the bench watching his team struggle to a 3-0 advantage over the Hawks. We assume he has been busy rehabbing the injury. 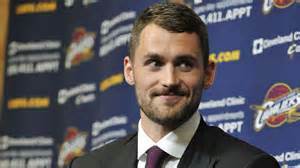 However, his absence says a lot about the chances he will stay with the Cavs or move on. If he can not be bothered to watch the team try to win him a ring what chance is there that if he gets one he will resign with the Cavs? The answer is clearly not much of a chance we will see him in a Cavs uniform next year. There are 3 critical questions we have to ask here. First, is there a better chance Love returns if the team wins a ring or if they don’t? I suspect that if he gets a ring he is gone next season. If the Cavs fall short, he could see the team as his best route to a ring in the near future. Next, will the relationship between Love and LeBron James improve to the point he wants to stay or will be another incentive for him to leave? While we have not heard much recently (in part because Love has been absent) the relationship between two of the “big 3” will be a major factor in Love’s decision. Last, what will ownership think of a GM that spent 2 #1 picks plus a 1st round pick in 2015 to “rent” Love for 1 year? While Anthony Bennett still looks like a bust, Andrew Wiggins looks like a quality player. General Manager David Griffin could well be on the hot seat. No question that Griffin did a great job getting J.R. Smith and some of the other parts of the team. But some say Griffin gave too much for C Timofey Mozgov (2 first round picks). If Love leaves, Griffin could be in serious trouble.